It has been a busy busy month. Seems like that is what I say every single month actually... But I really have been! Lots have happened this month - we moved into our new home, hubby and the lil one went to Crete on a holiday, and I was left home to sort out all the belonging. Well, most of them are sorted, but much more work is in order. It is getting there though, and I hope that seen we can get into proper decorating mode. And of course to do that before and after- renovation posts too. Seriously speaking, the change in this house is HUGE. We have gone from wine red plushy curtains and wine red carpets combined with dark wood veneer and a kitchen from the 1970's, to a very modern looking open-living style house with a cool gray-scale decoration scheme. But enough of that - some pictures I have been sharing on Instagram! 2. We have spent a good part of the month at the in-laws who live on the countryside. It is nice sometimes to be away from the hustle and bustle of London, although, not too long! 3. We celebrated our daughter's second birthday, um, three month ago. 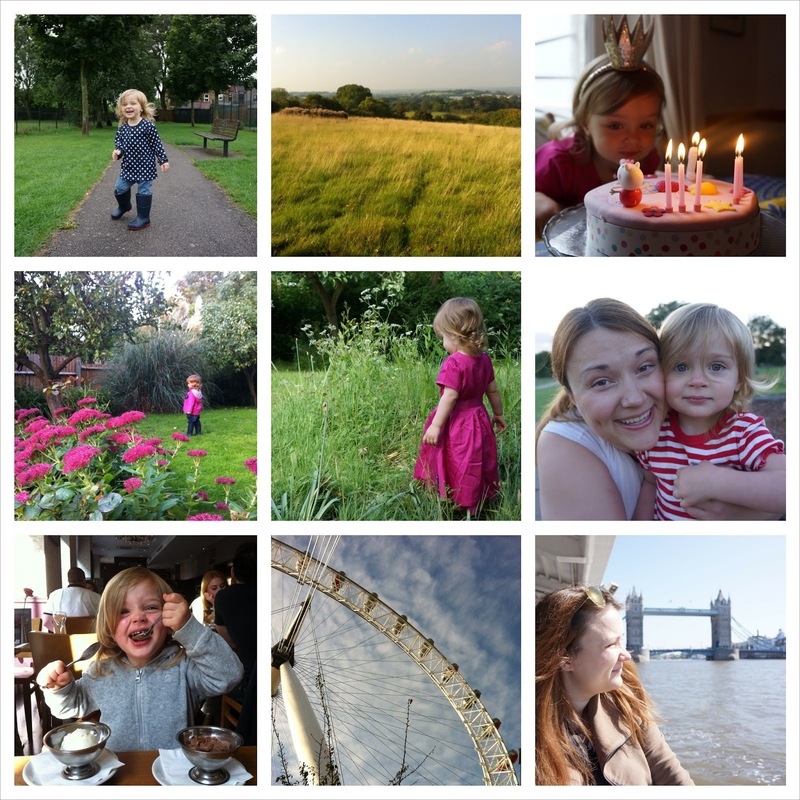 Not posting about it until a few months later mught make me a pretty bad mummy blogger... But I guess later is better than never! 6. Couldn't help but to share one more snap of us two. There aren't really enough of these pictures, I am almost always on the other side of the lense. 7. We went out, we had ice cream, she ate both of them. Look at that happy face though, with two bowls and two spoons! 9. An old snap of me on a river cruise - these are so much fun to do every once in a while. Oh how I do envy those that commute to work on the river bus - so much more fun than on the crammed tube! 10. 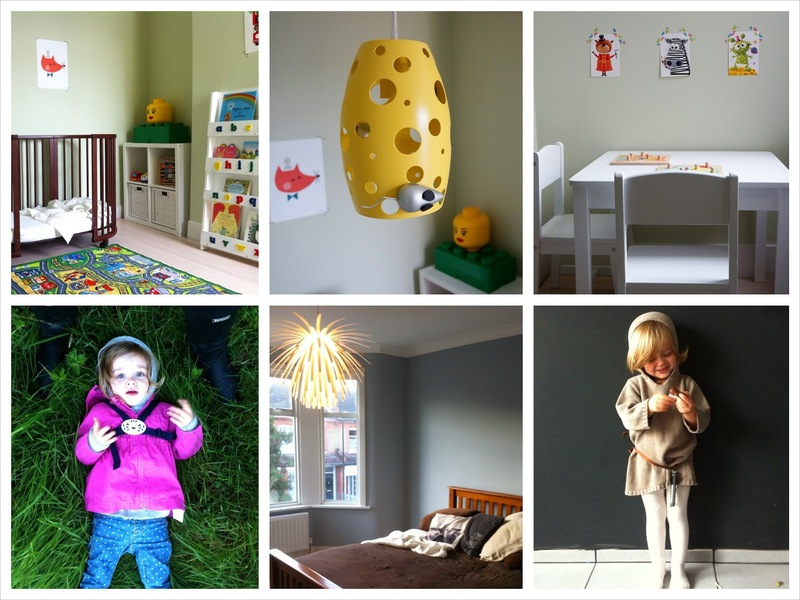 We moved into our new home, and one of the first rooms I set up was my daughters new bedroom. Loving it! 12. And a little table and desk to draw pictures on, and sit down and read. And some fun postcards I washi-taped on the wall for her amusement. 14. And the next room I shared was our bedroom. I love the light fixture - it is Danish(?) or possibly German design and called Snowflower. 15. And if you wonder what my little monkey was this Halloween - a mini Luke Skywalker. With her mini-size genuine replica. Courtesy of my (geek) husband. Do you guys have Instagram accounts? And how was your October? Thank you :) we really do love it here, and to me it already feels like a home. Though there is much to do still before it is ready! Thank you! It is startin to feel more and more like home :) still much to do though! Thanks for hosting! :) We are finally settling in here, although there is so much more to do, painting and reorganising... Hopefully it will be done by Xmas!